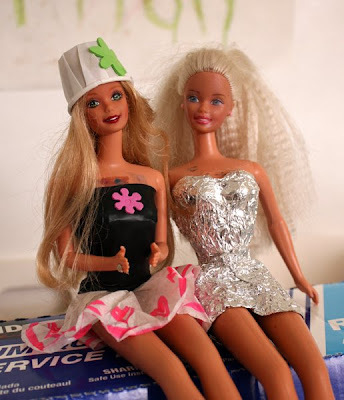 We went to a garage sale this weekend and the lovely lady that was holding it gave our kids all the barbie dolls she had for free. They were however all stark naked. 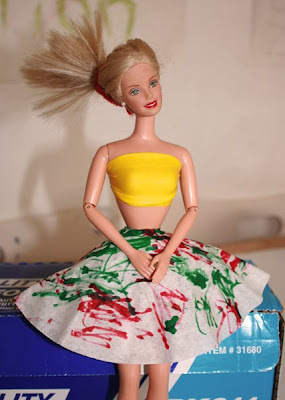 Sewing enough clothes for five barbie dolls wasn't going to happen any time soon (my sewing machine is lodged underneath a plethera of misc in the twilight zone that we call the guest room). We did however have a red plastic bag, a few coffee filters, some burst balloons, stickers, pipecleaners, aluminium foil and a few of those little ketchup cups you get at fast food places. Turns out you can make a fairly extensive wardrobe for dolls with this stuff. The kids coloured in and stuck stickers on the clothes and I dressed the dolls for them. 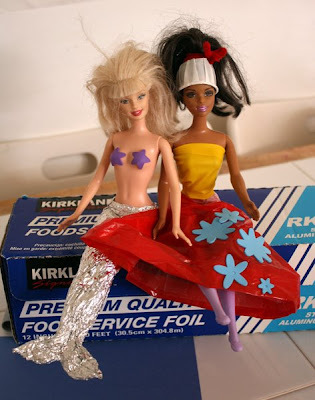 I think they like the mermaid best, so we may end up ripping off all the other gear and having five foil mermaids with strategically placed foam starfish before too long. 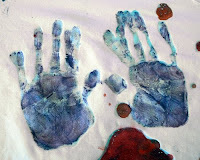 Gail Bartel just posted a great tutorial on her blog "That artist woman" about how to do batik with kids, but instead of using frightening hot wax and dye baths as traditional batik involves, which is far from kid friendly, she uses school glue and watered down acrylic paint. 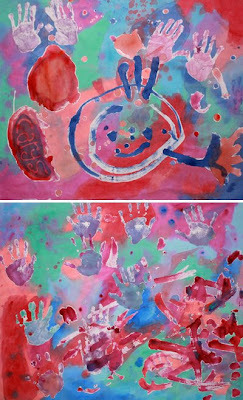 Me and the kids gave it a go and it was great fun, lovely and messy and turned out great. I was going to get Elmer's school glue, but Elmer's galactic sparkly glue (which is what Gail uses in her tutorial) was on sale at a quarter of the price, so I got that instead. I picked up a cotton bed sheet from goodwill and ripped it into squares about a foot and a half wide. 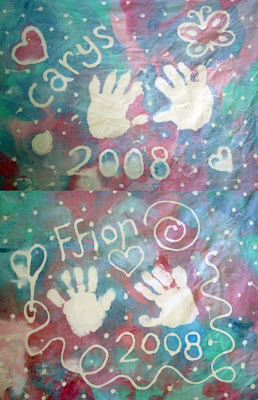 The kids painted their hands with the glue and then did handprints and I wrote their names, we did some other random spodging with the glue and then left it to dry overnight. 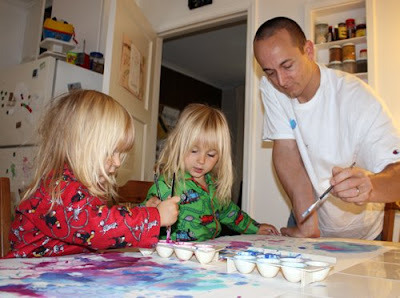 Next day I mixed up some watered down acrylic paint in the egg trays from our fridge and the kids and Paul painted over the whole sheet. Paul you will notice is wearing a white tshirt to do this. Silly Paul, and yes the kids are in PJs with bed head because it was before 9am. We left them to dry and then laundered off the glue to get lovely finished pieces that I think I'll make into cushions for their beds. We have lots more of the glue and spare sheet, so we can make more and maybe a cool patchwork quilt eventually. 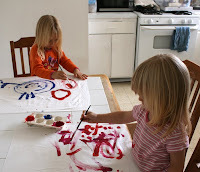 If your kids are a bit older and have a longer attension span then it would be cool to slip a sheet of cardboard into a pillowcase and do both sides. You will need: a plastic or paper cup, a water bottle, a large paper plate or a left over party hat, a small paper plate and some aluminium foil. I knabbed all the ones we used from a community pot luck event that I stayed behind to tidy up after. Glue the bottle to the bottom of the plastic cup. 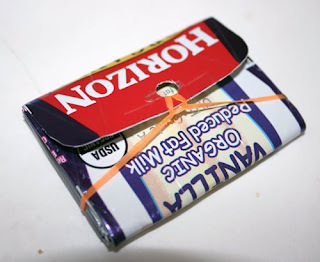 Wrap in aluminium foil and glue down the edge. 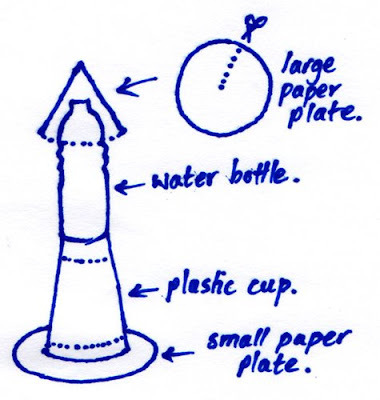 Cut a slit in the large paper plate to the middle and fold and glue into a cone. Stick on the top of the bottle. Stick the small paper plate on the open end of the cup. 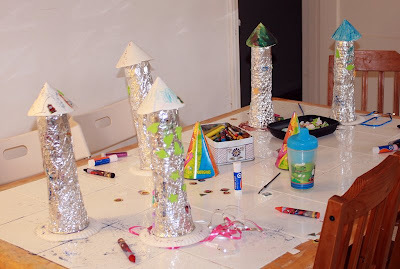 The kids decorated these with paint, crayons, stickers and glue and glitter. We added streamers to the bottom of them and after the kids had run about the house a bit with them, we hung them up in the bedroom. 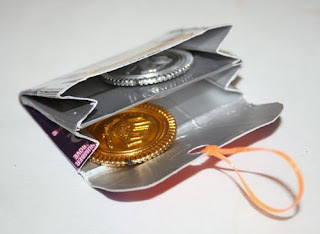 There are a fair few tutorials about on the net showing how to make little wallets or purses from used tetrapack containers. 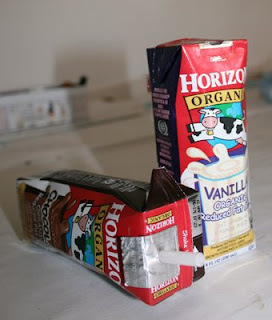 My kids love the occasional chocolate or vanilla milk, so I thought it would be cute to make them a wallet each from one of thier drink boxes. 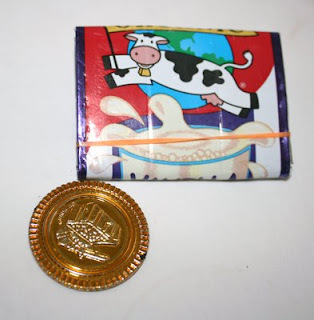 This site sells recycled tetrapack wallets, but you can see the process of how to make them from the little animation on the front page there. It's quite simple and if you weren't in quite so much of a hurry as we were then you could use a little velcro or a snap closure on them instead of the rubberband we used. I bet you could make a nice grownup scale one with a soup size tetrapack. Might be nice for keeping scraps of paper with recipes on in. 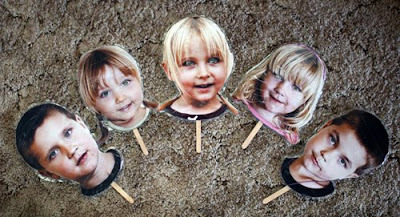 Thought the kids would have some fun if we made them masks of each other, so they could swap identities and be silly. It was pretty quick to do. Took a photo, printed it out on a full page, glued it to a bit of cardboard box. Cut it out. Used an exacto knife to cut out the iris of the eyes, so the kids could look through the masks. Gaffer taped a popsicle stick to the back and then to make them a bit more durable I put some strips of packing tape over them. 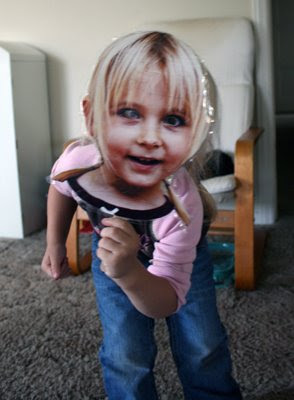 Here's a pic of my two year old pretending to be my three year old with her mask. We quite often make random stuff by glueing together what's in the recycling bin. 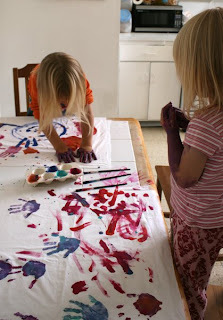 The kids help with putting it together and then they paint and decorate it and when it's dry, play with it. When the creation loses it's appeal they can pull it appart and put all the bits in the recycling bin outside. 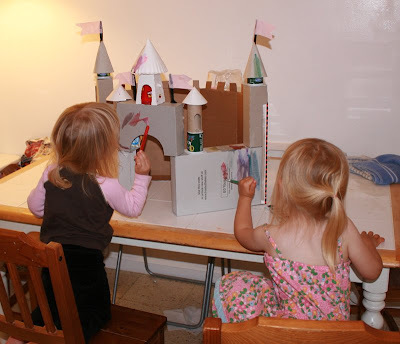 Here's the castle we made and the bizzare game of balancing teaset items on it that was popular for quite some time. Take a moment to notice the toy lion that looks like he's taking a leak on one of the turrets. Nice. 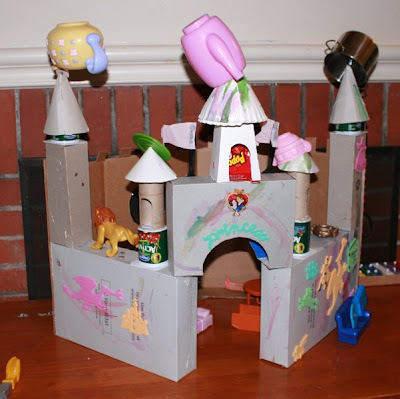 I think this was made up of a couple of cereal boxes, a pancake mix box, a kfc popcorn chicken box (mmm dirty), some yoghurt pots, some toilet roll tubes, some paper plates and a few plastic forks, oh and a couple of sandwich bag boxes.